This past weekend was the first ever Family Day in British Columbia, which meant a long weekend for most of us. So, I sacrificed a weekend of skiing to spending time with my family…in Winnipeg. This meant about 12 hours of travel in 4 days. I feel like I spend a lot of time in airports because I love to travel and have been travelling since an early age. I’m going to share with you some of my highlights from airport adventures…specifically security. Age 17 – I got hired to work at a summer camp in Cleveland, Georgia, so I had to fly to Atlanta. The summer camp “forgot” to give me the proper documentation (aka A WORK VISA) and so when it came time to clear customs…I failed. A scary man who did not understand what I meant by “going to be a camp counselor at a Jewish Summer Camp in America” and yelled me at for hours. Eventually, after many hours of crying and talking to the Director of the Camp, they let me though on a J1 Visa. Little did I know I was now “red flagged” at the US border. Note: this was the wrong Visa. Age 22 – After living in Edmonton to 8 months I made the hard decision to move to Vancouver. The day I moved I was very, very sick and really sad to leave my friends (especially Chase who took me to the airport). I was a hot mess and security found a corkscrew in my bag. This caused for a delayed and detailed search of me. I guess they thought I would open too many bottles on the airplane. 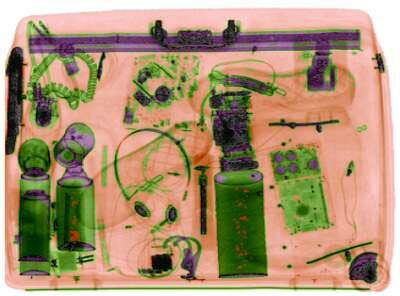 This past weekend – My carryon was searched 3 times because something showed up on the x-ray that looked like a knife. After searching my stuff and me over and over again….they found and confiscated a dirty butter knife. So, these are just some of my many run-ins with security. Has anything crazy ever happened to you? To follow my mountain life journey, check back every Wednesday (or sometimes Thursday) and read about my learning adventure. It is okay to learn to ski at any age. If I can do it, so can you! Please share your skiing tips and comments below. Cheers!